Are you dreaming about a straighter smile? You might want to consider Invisalign—clear braces often used by teens and adults who want to improve their smile. Invisalign braces are so cosmetic that when you're wearing them, others will hardly notice. Invisalign works by using custom-made trays that fit over your teeth, made from a special thermoplastic material that is designed to be durable and invisible at the same time. You won't just have one set of aligners. Over the course of your treatment, you'll be wearing several progressive sets of aligners that will gradually straighten out your teeth by making slight adjustments through continual wear. How Long Do You Wear Them? Invisalign treatment varies with each patient. The typical adult treatment can last up to twelve months, which is certainly a lot less time than you would spend wearing traditional metal braces. 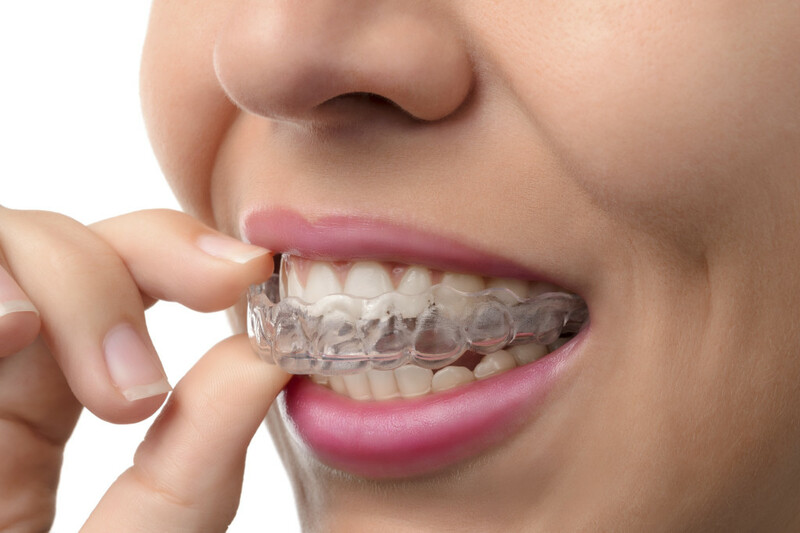 These clear “braces” should be worn between 20 to 22 hours a day, meaning you wear them when you sleep and go about your daily routines. One big plus with Invisalign is the ability to easily slip the trays on and off. It’s recommended that you remove your Invisalign aligners before meals. This means you won't have any interference from the trays, and you'll also be keeping them cleaner. Also, note that because you'll be removing the trays before you eat, there are no restrictions on your diet. You just need to brush your teeth after your meal but before you put the trays back in. As for cleaning, you can opt for the Invisalign Cleaning System or simply rinse them in lukewarm water. You'll be checking back in with your doctor every six weeks or so to make sure the treatment is moving along as it should and to discuss any questions you might have about the trays. Invisalign follow-up treatments are less frequent than with other forms of braces that have to be constantly adjusted. When you begin wearing Invisalign, you might experience some discomfort as you adjust to the fit and feel. However, you'll soon find that these clear braces are a lot less intrusive than the traditional metal braces. That’s probably why over three million people have already tried Invisalign! Once your course of treatment is complete, your orthodontist might recommend wearing a retainer. These would be the same kind of trays worn before but in this case, they might only be needed at night. Retainers are a great way to ensure that your teeth won't slip back out of alignment. To find out more facts about braces, you'll want to speak to an orthodontist who has dedicated their career to giving patients brighter smiles. At Kapadia Orthodontics, we have been working with kids, teens, and adults, providing them with quality care with all types of braces including the popular clear braces. One call to our offices at 407-366-3300 can set up a free consultation to discuss your smile concerns. You'll feel great just knowing you're taking a proactive step towards a happier smile! So what are you waiting for? Contact us today!